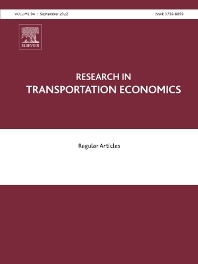 Research in Transportation Economics is a journal devoted to the dissemination of high quality economics research in the field of transportation. The content covers a wide variety of topics relating to the economic aspects of transportation, government regulatory policies regarding transportation, and issues of concern to transportation industry planners. The unifying theme throughout the papers is the application of economic theory and/or applied economic methodologies to transportation questions. The ultimate goal of Research in Transportation Economics is to provide transportation researchers a valuable source of information useful in the formulation of transport policy and industry decision making.